- Protect skin from external environment, moisturize and provide nutrition deep into skin. - Provide moisture with energy for vital glowing skin. - For sensitive skin, gel type soothing toner works for better result. - Mild ingredient balance moisture for clear skin. - Mix bb or foundation for moisture glowing make up look. 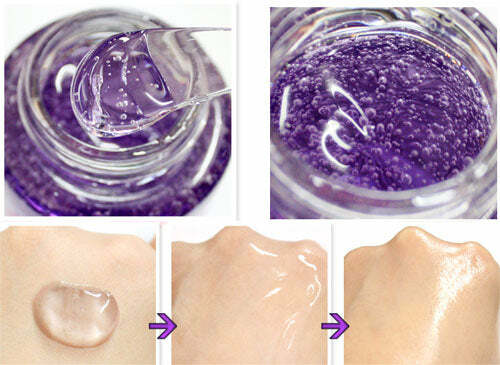 - Moisture melting texture moisturizing skin. ◆ Contains no artificial color. Grape, blueberry and purple queen's natural color. ◆ Contains no artificial scent. Spatula) Use small amount with spatula onto cotton, wipe out gently. Hands) After washing apply onto face tap gently for absorption. ◆ After washing face tap gently for absorption, apply moisturizer or nutrition cream. Can skip lotion or essence. ◆ Mix bb or foundation for glowing make up look. ◆ Keep refrigerator and use as pack for soothing care effect.